Fawn Murphy (my mom) reviews the official Capitol State Forest map before the ride. Having a map substantially decreases your chances of getting lost on your excursion. As the season edges closer to summer and the days get sunnier, outdoor enthusiasts flock to the trails winding through Capitol State Forest. Located predominately in south Thurston County and Grays Harbor County, the 90,000-acre forest with provides many opportunities for hiking, camping, mountain biking, dirt biking, and more. Because of its varied landscape ranging from old-growth patches, to marshy ponds, to clear-cut meadows, the forest also lends itself well to horseback outings. One recent weekday when my mother and I had coinciding days off of work, we took the horses out to the forest for our first ride of the season. Although we had ridden there in the past, we mainly stuck to the familiar and shorter Waddell Loop, which is most commonly traversed by horses. On this outing, we wanted to try a longer route we hadn’t taken before, and decided on riding the Mima Falls and McKenny trails. 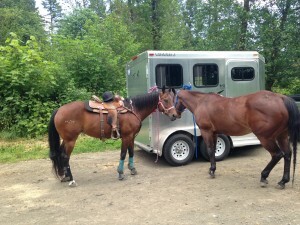 Powder and Odie are in the process of being tacked up for the ride. 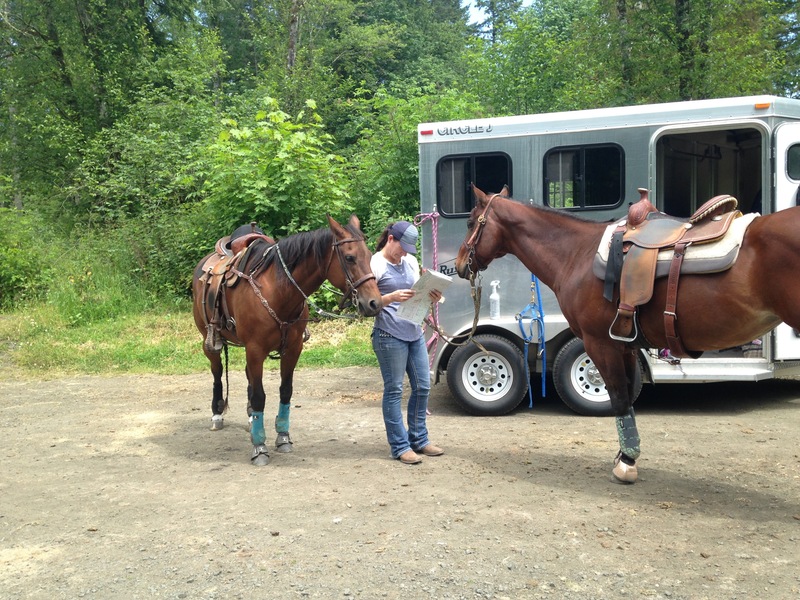 There is ample space at the trailhead to park several horse trailers. If you want to ride out at Capitol Forest, you need to purchase a Discover Pass if you don’t already have one, and display it in your vehicle’s windshield. Discover Passes are $30 for an annual pass, $10 for a day pass, and can be purchased at most Thurston County grocery stores and online. For a full list of locations, click here. Although the trails are for the most part frequently traveled and well marked, it is crucial to carry a Capitol State Forest map during your ride. The map not only details the location of trailheads and trajectory of logging roads, but also color-codes the trails so it is clear whether a specific trail is appropriate. We purchased a spare from the Littlerock Grocery Store on our way out. Pack some water with you as the weather gets warmer, because there are sections of the ride where the shade breaks. There is water available from a few faucets at the campsite for the horses. I also recommend riding with SMBs and bell boots, if you have them, to protect your horse’s legs because there are both muddy and rocky stretches of the trail. The ride starts at the Mima Falls trailhead right at the edge of the forest, located past the community of Littlerock near the Mima Mounds Natural Area Preserve. Be careful here if your horses shy easily, because the trailhead area is directly across the street from a shooting range, and is often quite noisy. Along with adequate space for horse trailer parking, the trailhead has several well-maintained, secluded campsites and wooden pens for staying overnight with horses. 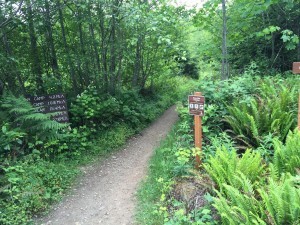 This is the entrance to Mima Falls Trail East, the start of the route we took. The trails in this section of Capitol State Forest are generally well-marked and easy to follow. From the parking area, head up the hill until you reach Mima Falls Trail East. The trails in this area are well marked with wooden signs, and with a Capitol State Forest map you should be able to easily find your way and determine your location. Continue on this heavily traveled trail for .5 miles until you reach a fork. Turn left at the fork onto Mima Falls Trail West, which winds for through an open re-planted area. Although Capitol State Forest is a working forest and some of its trees are periodically harvested, many trees are replanted each year. In 2012, a record-breaking 800,631 trees were planted in order to conserve the forest. After 1.5 miles, take a left turn at another fork to continue on Mima Falls Trail West. This next 5-mile section of the trail meanders several times over Mima Creek, and passes by Mima Falls. Beware if you think your horse may be scared of crossing bridges, because there are quite a few. Although it is difficult to see Mima Falls on horseback, you can dismount and follow a footpath for a better view. About four miles into this stretch, part of the trail was closed after a road crossing due to logging efforts. Because of this, we loped down the D-4000 road until we met back up with McKenny Trail. If you want an extended ride, continue down Mima Falls Trail West and take a left at the Lost Valley Trail junction. Follow McKenny Trail for 3.3 miles, and then for a brief .1 miles stay on Campground Trail until it meets the Mima Falls Tie. Riding 1 mile on the tie will bring you back to Mima Falls Trail East, and from this point you will retrace your steps for 2 miles until you arrive back at the trailhead. 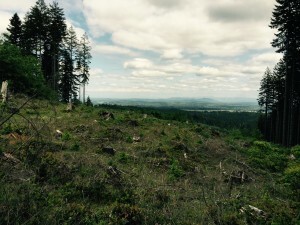 The Mima Falls Trail West section of the ride provides sweeping views of the south Thurston County area due to clear-cutting. To counteract the effects of clear-cutting, hundreds of thousands of new trees are planted each year, as shown in the photo. At 13 miles long, the ride took us about 3.5 hours at a brisk walking pace. Although we had a safe ride, a possible hazard is the presence of pedestrians not on horseback. Motorized vehicles are not allowed in this section of the forest, but you will share the trail with both hikers and mountain bikers. During my ride, bikers followed good trail etiquette and dismounted their bikes to allow us to pass first. If your horse is too scared to safely pass, ask the biker to stand in front of her bike; oftentimes they are more confident if there is a person between them and the unfamiliar contraption. This ride is good for riders of most skill levels, because of its clearly marked paths and friendly terrain. It is a perfect ride on a sunny day for both experienced trail riders and equestrians looking to get out of the arena.